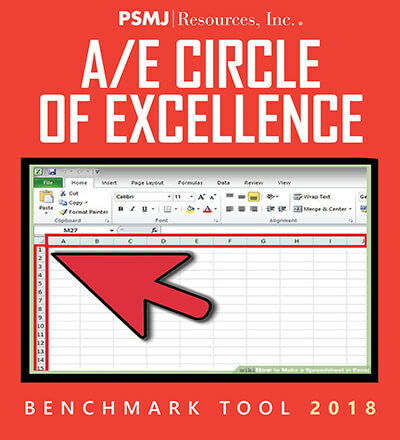 This one-of-a-kind product provides MS Excel spreadsheets containing the data that allows you to compare your performance against the very best in the business—the top 20% of those firms that participated in the 2018 A/E Financial Performance Benchmark Survey Report. 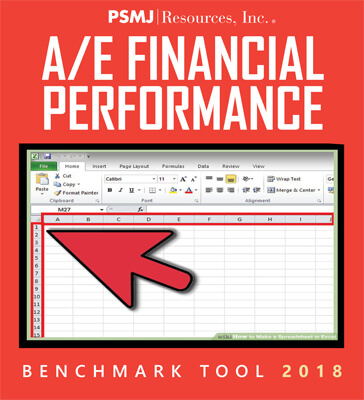 This one-of-a-kind product provides you with Excel-based interactivity pre-loaded with data from our 2017 A/E Financial Performance Benchmark Survey Report. Take your financial performance benchmarking to the next level! 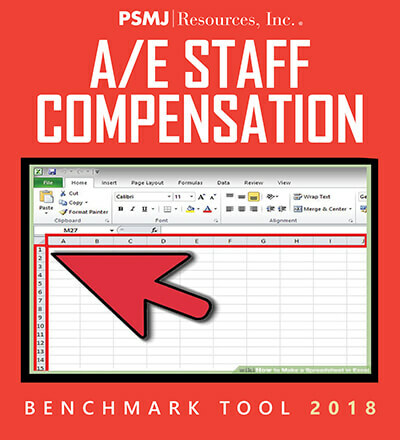 With PSMJ's A/E Staff Compensation Benchmark Tool, all of the work is done for you! 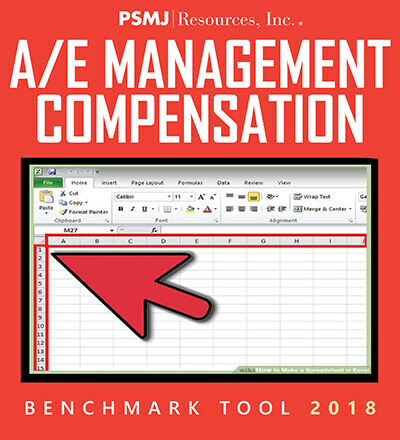 With PSMJ's A/E Management Compensation Benchmark Tool, all of the work is done for you! 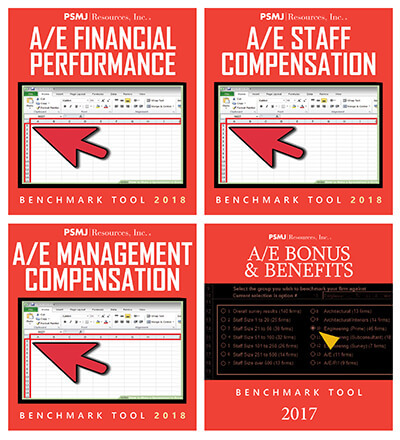 PSMJ's complete 2018 Benchmark Survey Report Tools and our 2017 Bonus & Benefits Benchmark Tool. 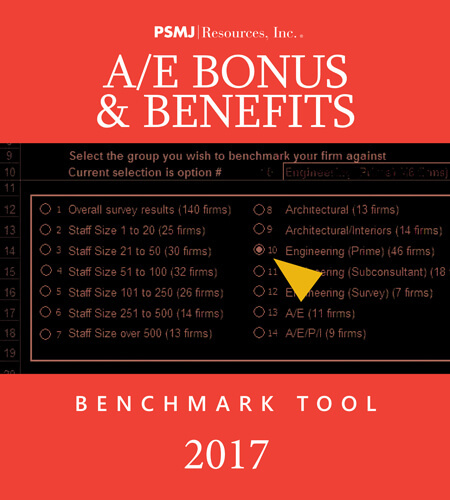 This one-of-a-kind, interactive salary tool allows you to compare your staff salaries to PSMJ's 2018 A/E Staff Compensation Benchmark Survey Report for architects, civil engineers, electrical engineers, mechanical engineers, structural engineers, environmental engineers, and landscape architects. But there is so much more! 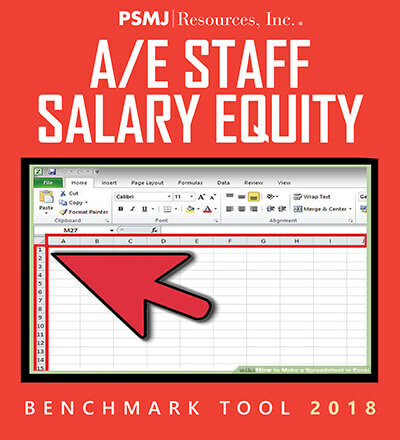 Using this tool, you can adjust your firm’s salary data based on the BLS data for your city, use visuals to help determine how or if any firm salaries need to be adjusted, and gain valuable insight into billing rates and chargeability! This one-of-a-kind, interactive salary tool allows you to compare your management salaries to PSMJ's 2017 A/E Management Compensation Benchmark Survey Report for chairman of the board, CEO, COO, and more. But there is so much more! Using this tool, you can adjust your firm’s salary data based on the BLS for your city, use visuals to help determine how or if any firm salaries need to be adjusted, and gain valuable insight into billing rates, chargeability, and revenue forecasting! 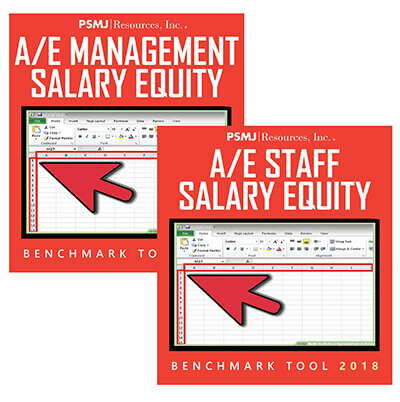 Both of these one-of-a-kind, excel-based, interactive salary tools allows you to compare your management and staff salaries to the most up-to-date PSMJ information available today for chairman of the board, CEO, COO, and more. This one-of-a-kind product provides you with Excel-based interactivity pre-loaded with data from our A/E Bonus & Benefits Benchmark Survey Report. Take your incentive compensation benchmarking to the next level! 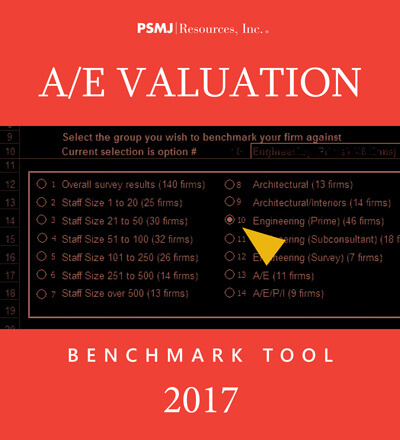 Based on the data published in PSMJ’s popular A/E Valuation Survey, this one-of-a-kind MS Excel-based tool makes it easy and fast for you to estimate the value of your architecture or engineering firm. This one-of-a-kind, interactive budget tool allows you to input data on the employees that work at your firm. 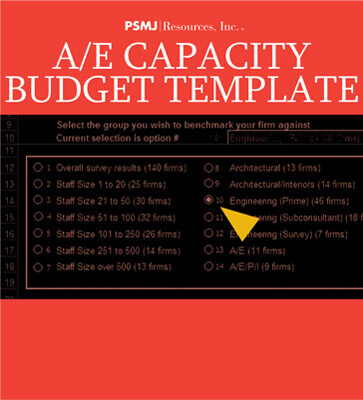 And from this information, generate such information as revenue projects, chargeability goals, and more. Using this tool, firm leaders can exam their firm’s data in a way that helps them determine quickly net revenue targets for the year, as well as total labor costs, and more!